Intramuscular Stimulation (IMS) is a dry needling technique - meaning nothing is injected during the process - used to target dysfunctional muscles that are causing pain. IMS has been found to be an effective treatment for acute and chronic pain, muscle tightness, as well as injury rehabilitation. 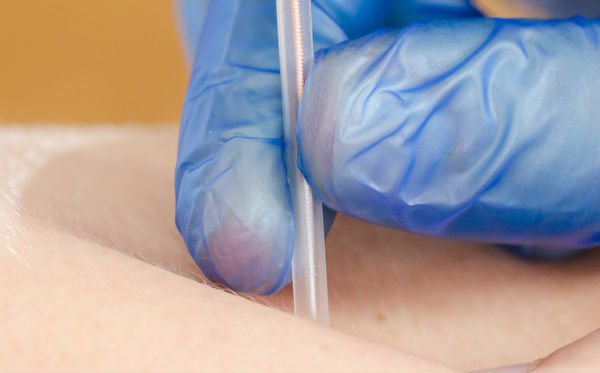 IMS uses thin needles (similar to acupuncture) to release taut muscle tissue and trigger points. The taut muscle tissue can apply pressure to neural structures, resulting in neuropathic pain, as well as mechanical pain from the muscle itself pulling on its attachments. By releasing the tension, pain can be alleviated from these two sources. Unlike acupuncture, the needles are not inserted and left there for prolonged periods - instead, the needle may be inserted and stimulated, or they are advanced multiple times to break up the tension. Your therapist will likely ask you to don a gown, shorts or tank top so that they can appropriately expose the area that will be released. Typically after treatment, you will be achy for the rest of the day. The ache can be managed with drinking lots of water, stretching, and heating or icing. By the next day you typically begin to notice improvements, however some exceptions occur. The best results are seen when IMS is used in conjunction with Therapeutic Exercise. Your therapist will design a home exercise program for you - making IMS an ACTIVE process, not just a stand alone treatment. At Peak Physical Therapy we have one therapist who is trained in IMS. If you are interested in trying it, book an appointment with Morgan! Make sure you have eaten before your appointment, and let your therapist know if you are feeling unwell, as the needling can exacerbate your symptoms. Information package download coming soon!